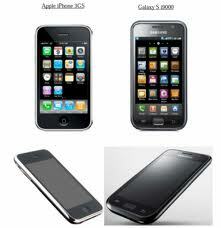 Nilay Patel at Thisismynext.com has embarked on an in depth examination of Apple’s new court action against Samsung. The “thing that distinguishes this case from Apple’s other actions against other Android products is the trade dress component (and the piquancy of Samsung being a supplier of major components for the iPhone and the iPad). Now, this case is not being brought in Australia but, if it were, one would wonder about the trade dress prospects given the clear Samsung branding in light of Parkdale v Puxu and its progeny such as Playcorp v Bodum. The only case where the trade dress got up in the face of clear branding is really the Jif Lemoncase, in which there was survey evidence showing an overwhelming preponderance of supermarket shoppers declaring they had bought a Jif Lemon, notwithstanding the swing tags and other clear branding. Those cases did not, of course, involve design registrations as well (or the functional patents). And, even on trade dress, Apple’s complaint is at great pains to point out the level of detail at which resemblances can be drawn. Logan J has granted injunctions against International Hair Care UK’s use of AFFINAGE (and other trade marks) on its global website for (in effect) infringing International Hair Care Australia’s trade marks registered in Australia. The facts throw up the interesting question of what happens when 2 different people own the same trade mark in different countries and try to use it on the internet. IHC UK is the owner of the registered trade mark AFFINAGE for hair care products in the UK and 20 other countries throughout the world, but not Australia. In 1992, Mr Barry, the principal of IHC UK, set up IHC Australia with Mr Jolly. At that time, Mr Barry owned a majority of the shares. IHC Australia applied for and registered AFFINAGE under the Australian trade marks act for hair care products. In 2002, Mr Barry sold his then remaining shareholding in IHC Australia to Mr Jolly (and his wife) for $480,000. IHC Australia kept its registered trade marks and, under the terms of the sale, the parties divided up the global rights between themselves. IHC Australia got the rights to AFFINAGE in China, South-East Asia, Australia, New Zealand and the South-West and Western Pacific to the International Date Line; IHC UK had the rights to the rest of the world. Sometime after this, Mr Barry or IHC UK incorporated a new Australian company, Affinage Salon Professional Pty Ltd, to sell hair care products under the brands A.S.P. and KITOKO. not to use AFFINAGE … as a sign in connection with the importation, marketing, sale or manufacture in Australia of hair care products including hair colours and dyes. 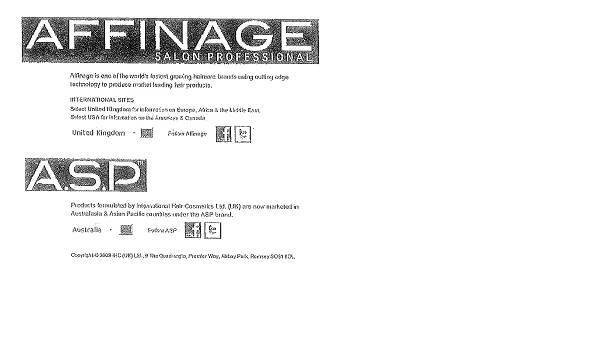 In 1996 [IHC UK] conceived, created and lunched the premium hair care brand AFFINAGE. Originated as a line of hair colour, the AFFINAGE brand grew rapidly to include [reference to other types of product]… Now we are introducing our exciting new hair care brand, ASP, to the Australian and Asian markets. Having already signed distribution agreements with a number of companies we look forward to fantastic success in 2011. A map of the world showed markers ASP Australia, ASP USA and identified the UK as Worldwide HQ. If the UK or the USA were chosen, the same information was displayed, but the landing pages were headed AFFINAGE and AFFINAGE, not ASP, was used to mark the countries. IHC Australia re-commenced proceedings for breach of the undertakings. Following service of the court documents (no other notice of complaint having been given), IHC UK amended its website. and Australia no longer appeared in the drop down box for countries under AFFINAGE, only under A.S.P. Logan J found that the website in both its unmodified and modified form breached the undertaking in the deed of settlement and granted injunctions, amongst other things, requiring the A.S.P. component of IHC UK’s website to be removed from www.affinage.com. In contrast, the Facebook and Twitter links on the home page did not breach the undertakings. On its true construction, the undertaking required IHC UK not to use AFFINAGE in Australia as a trade mark (at ). This required that IHC UK not use AFFINAGE as a trade mark in a way which targeted Australia. His Honour recognised that IHC UK was perfectly entitled to use its trade mark in, for example, the UK where it was the registered owner. The problem was to reconcile that entitlement and the global nature of the internet with IHC Australia’s territorial rights in Australia. … the reconciliation to which I have just referred is achieved, in terms of the undertaking given in this case, by an approach that finds a use of the nominated words in connection with “marketing” in Australia if the words as so used are downloaded in Australia and there is evidence that the use was specifically intended to be made in, or directed or targeted at Australia. that global web site is, inter alia, directed to or targeted at Australia. That is the whole purpose of the “Australia” option in the drop down box selection offered on the global landing page. …. That Australian targeted use on the global landing page controls all that follows when one selects, as did Mr Bennett, the “Australia” option in the drop down box. While IHC UK could legitimately say it introduced the brand AFFINAGE into Australia as a matter of historical fact. Its usage of the term went much beyond that. When one reads the language of the “Profile” page in context, the repetition of AFFINAGE and the repeated use of “our brands” in conjunction with “worldwide” and “are marketed globally by IHC UK and through its associated companies in the USA and Australia”, the reference to Affinage is not just to a matter of foreign history but part of a current promotion that our goods worldwide, including those offered in Australia, include goods with the AFFINAGE brand. …. No doubt, part of that context included the fact that one landed on a home page emblazoned with the AFFINAGE banner. But, his Honour, as in the Mantra case, was troubled by the repetitive use of the trade mark and, particularly, the representation that “Our goods “are marketed globally … in the USA and Australia”. His Honour also made the point that nothing on the profile page made it clear that IHC UK no longer held the rights to AFFINAGE in Australia. The “setting” for the viewer of this global landing page has undoubtedly changed and changed in a way that seeks to create a discrete Australian “target”. What remains though is a determined endeavour to place AFFINAGE in the mind of the viewer who has an interest in reading further in relation to Australia. The Australian “target” remains on the global landing page as a fixed feature. A connection between the AFFINAGE brand product and the ASP brand, each formulated by IHC UK is promoted and promoted to an Australian viewer. What the global landing page does not say is that IHC UK has no connection with the AFFINAGE brand in Australia. Instead, the overall “setting” is that there is an Affinage world brand in which the Australian province is known as “A.S.P.”. This, in my opinion, remains a use of that sign in Australia in connection with marketing contrary to the terms of the undertaking. any links between any new A.S.P. website and the AFFINAGE website. For those interested in procedural matters, Logan J refused to follow the Ucorp ruling and concluded that FCR O35 r11(2) conferred a power only; there was a discretion whether or not to award an injunction once it was shown the terms of the undertaking had been breached. Mr Bohdan Zograf has very kindly translated the IPwars post on Telstra v PDC into Belorussian for the benefit (one hopes) of everyone in Belorussia interested in IP! Those of you with the appropriate linguistic skills can see it here.